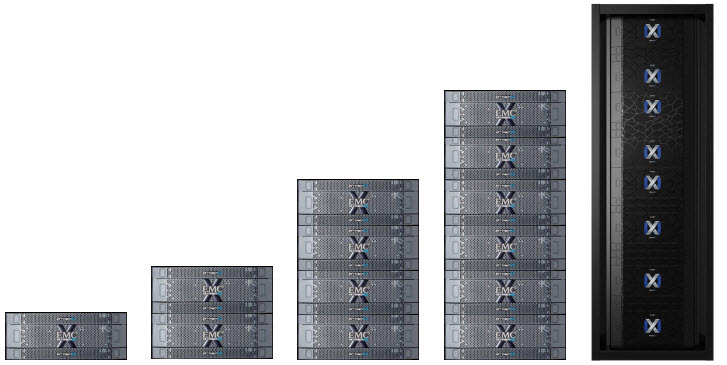 • A single Xtremio Management Stations(XMS) can manage up to 8 clusters. XMS Multi-cluster support is a new feature of 4.0 and allows clusters running 4.x code and above to be managed by a single XMS. When an XtremIO 3.0 cluster is upgraded to 4.x then it can be added to an XMS 4.x managing multiple clusters. If you consider a host has 2 initiators this would imply a max of 512 hosts. If you consider a host has 2 initiators this would imply a max of 32 hosts per Initiator Group. A starter X-Brick has 13 eMLC SSDs(a standard X-Brick has 25 eMLC SSDs), a starter X-Brick can be expanded to a standard 10TB X-Brick by adding 12 SSDs. Once the starter X-Brick has been expanded to a 10TB X-Brick then it may be scaled-out as per a std. 10TB X-Brick to two and four X-Brick clusters. Another useful one may be max clusters per XMS is now 8 instead of 1. I have question on DATA AT REST ENCRYPTION, is it enabled as default feature in 4.0 Maximums? As David mentioned you choose during install. The SED (self encrypting drives) are used in encryption supported Array (you may have to check is the array has SED’s or not). You can find that in Powerlink or from Solve desktop. A unique Data Encryption Key (DEK) is created during the drive manufacturing process. The key does not leave the drive at any time. In short the AK is changed from default to a new value when you enable encryption by running command — modify-clusters-configuration encryptioncommand=”switch-mode” encryption-mode=”self”. This AK is generated for each disk individually. Disabling and enabling encryption need the cluster not to be servicing any IO. I hope this clarifies. Is there any recommendation about volume size according to the Application which will be using that volume ? I have been following many posts from you and they are all very very informative and clarifies my doubts everytime I read them. Just one question/doubt I have got. The 10TB X-Brick should have 400GB disks correct? hi Dave, does the DARE require any license? or it is inbuilt feature?